Maybe it’s because it’s almost Easter. Maybe because my baby is cutting his first tooth, and my oldest is officially registered for TK. Maybe because, materially-speaking, our life looks a little bit different, and we are, almost tangibly, in the middle of new things. We upgraded my car. We’re in the middle of renovations on our current house – first the laundry room, then the downstairs laundry room and the master bedroom fireplace. Next week, the crown molding and the start of the kitchen demo. Meanwhile, we’re looking for THE house and scheming about a future vacation home. The one my sisters and I have been drooling over has eight bedrooms – EIGHT – and TWO kitchens. Also, a home theater with vintage pea green velvet seats and a legit indoor saltwater pool – a girl can dream. Maybe because it’s officially spring – the season of orange blossoms, baseball games, strawberry picking and new quarterly goals. Or maybe it’s because around us, planes are literally falling out of the sky, children seeking refuge wash up on ocean shores, and deep, debilitating poverty still exists. Maybe the exact combination of joy, hope and reality is the reason why this verse has been reverberating in my mind and in my heart – See, I am doing a new thing! I am doing. Present tense. It’s happening now. A new thing. Something even better than what we could imagine or hope for. As a mom, I’m always on the lookout for the new thing – the funny new phrase, the skill to add to the baby book. This season, I’m remembering to look for the new in my own life – the practices that bring healing, the goals that bring growth, and the everyday acts of redemption that God is working into my story. +Gratitude practice. I’ve been using Rachel Hollis’ Start Today journal as part of my morning routine. The combined practice of writing down the specific things that I am grateful for along with my ten biggest dreams and the next goal that I’m working on has been game-changing for me. This practice has absolutely helped revive my joy. +On reading more. I have books scattered all over the house, ones that I bought and ones that I checked out from the library, that I can pick up easily. Educated is on my coffee table, Keep Showing Up (the quote that stuck with me – “If you’re not praying for your spouse, who is?”) is next to our bathtub, Outer Order, Inner Calm is the kitchen. I read The Song of Achilles (could not put it down!) and Devotion: A Memoir in bed and Girl, Stop Apologizing while I nursed baby M on the glider. On my Kindle: Inheritance. On my vanity: The Situation and the Story. Currently on my nightstand: The Passion Paradox, Circe, and Grumpy Mom Takes a Holiday. +Sun Bum chapstick (in Mango, Banana, Watermelon, and Coconut). You’re welcome. I have one of these in running water bottle pouch, another in my wallet, one in my car, and one in my jogging stroller. +I’ll Have Another with Lindsey Hein, Episode 172. My friend Holl recommended this podcast, and while it’s geared towards athletes, specifically runners, I could absolutely relate to being a “pusher”. Also, Lindsey has four boys! (My future life?). The guest on this episode talked about how he was going to go into journalism and ended up studying Economics instead. I received a scholarship to go to the Northwestern School of Journalism, but the cold, Chicago winters turned me off, and I stayed in Southern California instead, and studied Econ. I’m currently reading The Passion Paradox because of this podcast. It feels both heavy and appropriate to start the year off reading one of the most existential books I've ever read: When Breath Becomes Air. This book was all of it: beautiful, brilliant, simultaneously esoteric and grounding – about calling and purpose and the work that only he could do. The last few pages of my copy are wrinkled in spots where tears fell. Watch the Katie Couric interview with Dr. Lucy Kalanithi, here - I tear up without fail. 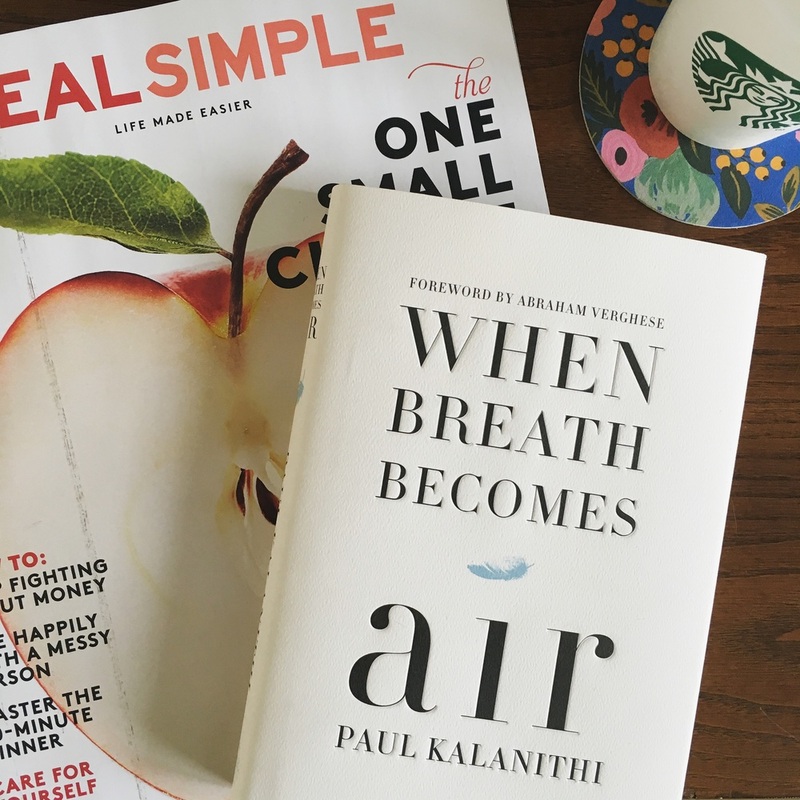 Book pairings: Being Mortal by Atul Gawande. The Year of Magical Thinking by Joan Didion. The day that David proposed, he assembled a picnic of food from our favorite places. He picked up roast beef sandwiches from Clementine’s, mint lemonade from Literati, strawberry steak salad from Damon & Pythias, cupcake babies from Vanilla Bake Shop. I had an early class, and all I wanted was to go back to my room and take a nap. But the food convinced me. He was speaking my language, a language that I had discovered sometime in college, somewhere along our string of dates. Seven years since then, some of my favorite memories involve food, with him. There was Athens on our honeymoon. We took naps in the afternoon, sunburned and tired form the heat of the day. By the time we woke up, the subway was closed, so we would take a taxi to the plaka. One night, we had street gyros after seeing Public Enemies on a building rooftop. Another night, we ate dinner by moonlight, al fresco at a restaurant that served us watermelon after our meal. It was the best watermelon I’ve ever tasted. Then, on our first anniversary, there were strawberries in wine at a little restaurant on a corner in Santa Barbara, one of my favorite places in the world. On vacation in Palawan, on our island-hopping tours, we ate fish, bought fresh at that morning’s market, grilled over a fire, small enough that we could each have our own. And afterwards, in town, halo-halo that we ate out of pastel-colored plastic ice cream sundae glasses. In Shanghai, our home for over a year, we lunched at Mr. and Mrs. Bund for David’s birthday, one of about five days in the city where the sky was actually blue. The sauce served with the steak was foamed, and the fruit with lime and pop rocks will always be a favorite. The first time we went to Da Dong in Beijing, we walked for miles in the freezing cold, not realizing that there was a location down the street from our hotel. The Peking Duck is the best there – the skin so crispy that it melts in your mouth and the sauce almost a molasses, rich and dark. They have complimentary drinks in the waiting area, because there is always a wait at Da Dong, and the last time we went, they had pitchers of a strawberry whisky cocktail. We celebrated our 4-year anniversary in Paris and the wedding of one of my college roommates. The only time we’ve ever ordered a full bottle of wine for ourselves was in Paris, at Le Bistrot Paul Bert, where Dave picked out the best Pinot Noir i’ve ever had and where the raspberry macaron we had for dessert was the size of my head. Fancy dinners out aren’t at the top of our list now, with a baby and my strong affinity for sweat pants. But date nights are more important than ever, when we take time to connect not about work or bills, but about our hopes and fears and the work that God is doing in our hearts these days. that I get so excited to fill in every day (that would make a great gift for Valentine’s Day, if you’re looking ahead).
. I want to do more of it in 2015, starting with date nights in, starting with cooking through this book, creating space to connect month by month.